Thermogenic Pre Workout supplements focus on fat loss in the gym through accelerating metabolism and targeting fat deposits for energy use. These expectations are most efficiently met via the combined use of stimulant and non-stimulant fat burning ingredients. Many fat burner pre workouts make the mistake of only containing stimulants (and often too many of them). In the long run, this hinders your weight loss goals, as your initial fat metabolism will inevitably lose momentum when your body becomes stressed and drained from too much stimulant consumption. This is the main reason why we made this page. So that you can see which thermogenic pre workouts are going to help you burn more fat without making you feel drained and abused. Note: If you work out at night, we recommend you look at our best fat burners list for supplements that you can take in the morning instead. We don’t want you to be unable to get a good nights sleep because you took pre workout late at night. Likewise, a lot of our readers who lift at night and avoid caffeine choose stimulant-free pre workout supplements to get a great pump and boost endurance. The logic behind taking a thermogenic pre workout supplement instead of taking diet pills is simple. Consider the diet advice you hear and what you read on the bottles of diet products… Time and time again, you will read ‘this product works best alongside daily exercise’. That statement is a fact; exercise is literally a fat-loss multiplier. And now consider the possibilities, when you take a thermogenic fat burning pre workout supplement upon exercising… Doing so means more energy to work out and burn calories, more calories burnt via the supplement, and more calories burnt specifically from fat storages. Not bad. The feeling of taking thermogenic pre workout supplements is very similar to regular muscle building pre workout supplements. Upon supplementing approximately 30 minutes before exercise, you will experience an increase in energy, alertness, and a feeling of increased athletic potential. These sensations will stay with you during your workouts, optimizing your workout mentally and physically. In the end, more calories will be burnt versus taking a regular pre workout supplement or no pre workout at all, since the fat burning pre workouts we’re going to share with you are top notch. We’ve limited this list to 5 supplements since these pre workouts are extremely specialized for burning fat. If you would like a regular pre workout for building muscle, you can view our official best pre workout supplements ranking instead. We recommend this to anyone wanting to gain muscle mass and strength. Kicking off our ranking on the #5 spot we have Cellucor’s own C4 Ripped. 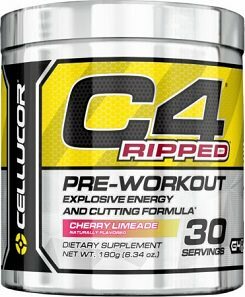 According to Cellucor, C4 Ripped is an “explosive energy and cutting formula”. In our opinion, it’s not too bad for a small-dose product aimed at tasting good. The specialized fat burning ingredients that separate other C4 variations from C4 Ripped are: L-Carnitine Tartrate, Green Coffee Bean Extract, Capsimax® Cayenne, and Coleus forskohlii root extract (all totaling 1 gram together). This is a good range of ingredients, however, in our opinion there should be more than 1 gram total here. It’s a bit under dosed. Despite this, we are content with Cellucor C4 Ripped ranking in at #5 which isn’t bad by any means. C4 Ripped tastes good, is easily obtainable in nearly any supplement store, and isn’t overloaded with stimulants. The only downfall is that the overall fat burning profile is pretty light. 2 Shredded Thermogenic pre workout is an enjoyable pre workout to take given its stimulant and mental focus blend. Pair that up with its great taste, and this will be something you look forward to taking before every workout. But, is the fat burning matrix good? It’s better than C4 Ripped, but has room for improvement. Let’s look at the key specs for Beast 2 Shredded pre workout fat burner. Like Cellucor C4 Ripped, 2 Shredded has a small fat-burning specific matrix. 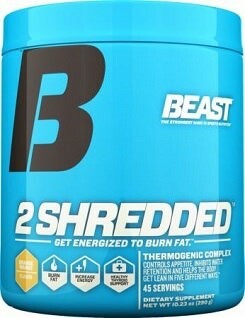 However, 2 Shredded has an impressive focus complex that will make it a much more enjoyable experience than C4. This focus matrix contains: Choline Bitartrate, Ginkgo Biloba, Vinpocetine, Huperzine, plus caffeine derived from coffee beans and green tea. For the overall experience factor, we rank 2 Shredded above C4 Ripped. The next 3 pre workouts are better fat burners. 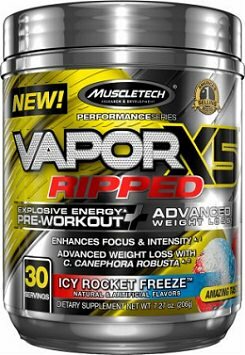 Nano Vapor X5 Ripped contains less fat burning ingredients than the former 2 pre workouts. However, the fat burning ingredient is yohimbe which is highly effective. Each serving of Vapor X5 Ripped contains 20 mg of Yohimbe, which is a strong dose. In order to get the most out of Muscletech’s X5 Vapor Ripped pre workout, you are going to want to take it in the fasted state. This is because of the Yohimbe, which appears to trigger fat metabolism (or at least make fat metabolism easier) when your blood sugar is low. But despite Yohimbe’s strength as a fat burner, it isn’t always smooth sailing. A lot of people are sensitive to Yohimbe, and develop anxiety, rapid heartbeat, and perfuse sweating when taking yohimbe or yohimbe with caffeine. Because of this, Vapor X5 Ripped is locked in as #3. 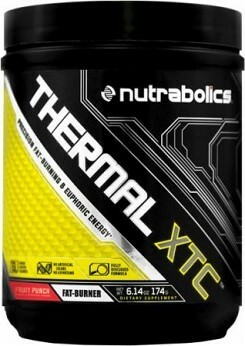 Nutrabolics Thermal XTC is a small-dose fat burning pre workout that is sure to get your energy levels and fat burning potential up! This fully disclosed label contains 11 ingredients that make this pre workout what it is. Thermal XTC appears to stimulate fat metabolism by increasing thermogenesis with stimulants as well as improving thyroid function. For this thyroid support, we notice the large L-tyrosine dosage as well as Guggulsterones which are both known to support the thyroid and improve function. And, with a better performing thyroid comes greater energy levels and fat metabolism. Also of note is the ingredient Gamma-Butyrobetaine. This is a precursor to carnitine, and appears to upregulate your body’s ability to make more carnitine, which may result in more energy and fat metabolism. The previous thermogenic pre workouts can certainly burn some fat and improve endurance, but PreSeries Lean is second to none. Each serving of PreSeries Lean contains over 14 whole grams of active ingredients. Compare that to the 5 gram average for the previous 4 products. And with those 14 grams, comes incredible performance and fat burning potential. PreSeries Lean greatly improves your performance through its unique stimulant matrix that gives you incredible energy without the jitters, along with its 6 grams of citrulline malate, 2 grams BCAAs, 2.5 Grams BetaPure Betaine, and 1.5 gram beta-alanine dosage. But that is only part of what makes PreSeries LEAN great. The BCAAs in lean help to prevent muscle wasting, allowing you to metabolize more calories instead, the stimulants increases your resting metabolic rate without adversely effecting your heart rate, and the whole formula is sugar and carb free – meaning your blood sugar will not spike and hinder fat metabolism like other pre workouts may cause. Plus, the thyroid matrix isn’t too bad either. 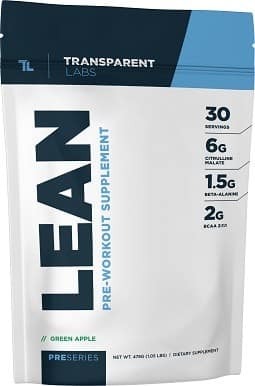 In order to improve your energy and fat burning both inside and outside of the gym, LEAN contains a thyroid matrix of: Iodine, Zinc, Selenium, Copper, Chromium, and Guggulsterones. This is the most comprehensive thyroid support matrix that we’ve seen in any fat burner. Overall, PreSeries Lean crushes the fat burning pre workout market. Nothing else comes close to being this effective, while remaining so incredibly clean and responsible. The only downside to this product is that you won’t find it in GNC or Amazon. But you can find it along with Transparent Labs other premium supplements on www.transparentlabs.com. If you are new to thermogenic pre workouts and even fat burners as a category, hear this. It is very important to assess tolerance and follow directions for both your personal comfort and fat burning effectiveness. Not only will this make you feel better and get better results, but you will save money. We recommend beginning new supplements by taking less than the recommended serving. All supplements are selectively intense, meaning different people will feel stronger or weaker effects. This will help you find your sweet spot faster. Is Taking More Thermogenics better? It’s the American mindset to think that ‘if some is good, more is better’, but in the world of thermogenics and the majority of specialized supplements that is not the case. Thermogenic and like fat burners are clinically dosed to be as effective as possible. By taking more, you are at risk of overloading your body and causing ‘stress’ which we all know leads to fat storage. So, take home message- relax and stick to the recommended doses! Direct your focus to the gym, being happy, and the new you that will be shining soon. There are a few helpful supplements that can really make a difference in any weight-loss thermogenic routine. Besides a lean protein source, we are major BCAA advocates. As you will see, our favorite choice is another Transparent Labs product, BCAA Glutamine. You can view the whole ranking via the link below and why we came to this conclusion. Best BCAA Supplements – Find out how to take BCAAs to build muscle, lose fat, or improve recovery; as well as which BCAA supplements we like the most. Note: total BCAA dosage is very important! If you have any additional questions or concerns, be sure to tag us below and we’ll get back to you within 24 hours! It’s important to us to answer sought after questions regarding to pre workouts, so you’re doing us a favor! Can I take green tea fat burner and a stimulant free pre workout?